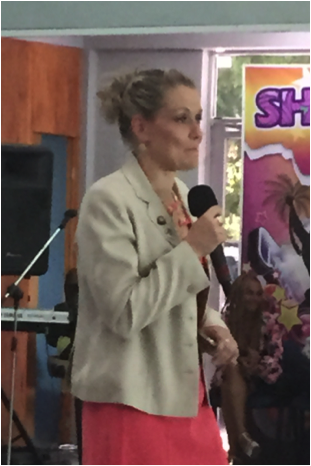 In July 2015, Golden Rule World Peace Ambassador Dr. Michal P. Pitzl addressed the youth at the Youth Empowerment Conference – HEY – in San Andres, Colombia. Dr. Pitzl skillfully challenged the youth that were present to tap into their greatness and live unlimited in their thinking. As a World Peace Ambassador and an educator Dr. Michal knows the value of honor and education and that every life is valuable and can make a difference in the world. She presented an animated challenging message to the youth of this conference. Dr. Michal Pitzl is one of the youngest Chancellors for an International Online College and Seminary. She has lectured and trained instructors internationally for several years. Prof. Michal has developed multicultural curriculum for online distance learning and instructor training worldwide. Her academic degrees include Bachelors in Human Development & Teaching Certification and a Bachelor in Theology. Prof. Michal also has a Masters in Curriculum and Instruction and a Doctorate in Biblical Counseling and Philosophy of Christian Leadership. She is also the recipient of an Honorary Doctorate Degree of Divinity, as well as an Honorary Doctorate Degree in Humanities from Fuerza y Honor International – El Salvador. Prof. Michal is also the Co-Founder of the Life Coaching Model for Latin University of Theology. The Golden Rule International Award is now established in 120 nations of the world. This organization seeks out top achievers that live the Golden Rule in their everyday life. This is a new global ethic that the leadership of the Golden Rule International Award, Patron, former President of Ethiopia, Girma Wolde and Ambassador Mussie Hailu have embraced and are promoting globally. Ambassador Clyde Rivers is the Representative for the Golden Rule International and the Interfaith Peace-Building Initiative, North American Division to the United Nations – New York. Interfaith Peace-Building Initiative is affiliated with the Department of Public Record (DPI) – United Nations as well as affiliated with the United Religious Initiative (URI), an Interfaith Peace organization. United Graduate College and Seminary International is in over 50 nations, has over 100,000 graduates and was founded in 1982 by Dr. Martin Wisor. It is a private Christian College and Seminary. UGCSI offers ministry training and ministry degrees through e-learning programs globally. The organization provides tools for Christian around the world seeking higher education.